But that Wellington has long gone. The Victorian and Edwardian buildings which comprised the cityscape of my childhood have mostly been replaced — to meet the demands of earthquake regulations and urban New Zealand’s obsession with continuous refurbishment. Against the concrete and asphalt backdrop of James K. Baxter’s “sterile whore of bureaucrats”, the young of post-war Wellington played out their childhoods. The late forties and early fifties, reeling from the effects a terrible war and the depression that was its genesis, are usually painted as colourless and dull. That isn’t how I see it. Looking back, life for the young then was less standardised, codified and certainly less cosseted. As one who has always been discomforted by proscription, that suited me fine. Playing Against the Wind doesn't pretend to be a window on the history of those times, but rather a selective glimpse — through a fence long ago replaced — at a ramshackle past. mailorder from Ngaio Press to anywhere in the world. 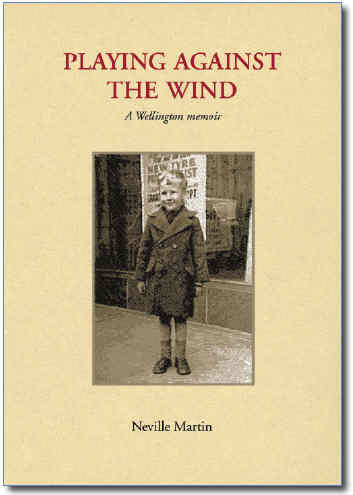 Click here to return to the Ngaio Press home page.